Harry C. Stutz is one of the great automotive pioneers of the last century, mentioned among notables like Bugatti, Miller and Duesenberg. One of his first forays into automobile manufacture was the design of an engine for the American Motor Car Company’s Underslung model. Stutz formed the Ideal Motor Company in 1911 and immediately saw the importance of marketing his automobiles through racing. The very first car that left the Indianapolis plant was delivered straight to the track to compete in the Indianapolis 500, finishing 11th with no mechanical issues or failures and earning the slogan, “The Car That Made Good in a Day.” One year later, the then-renamed Stutz Motor Company’s cars were seen as some of the finest money could buy. In 1926, engineer Frederic Moscovics developed the “Safety Stutz” chassis with a double drop that gave a low center of gravity, excellent handling and a rakish look. Four-wheel hydraulic brakes were fitted, as well as a worm-drive rear axle. 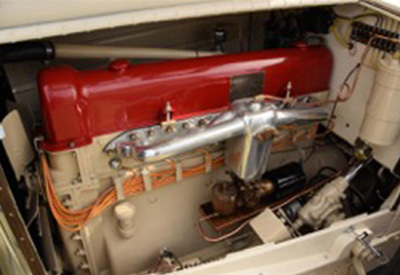 The new “Vertical Eight” straight-8 engine had a single overhead camshaft driven by a link-belt chain and featured a twin-plug ignition. It was smooth, powerful and quiet. In 1927, a Vertical Eight-equipped model AA set a 24-hour speed record, averaging 68 mph over 24 hours and Stutz backed that up in 1928 when its vehicle finished second to only to the Bentley Boys’ entry at the legendary 24 Hours of LeMans race. 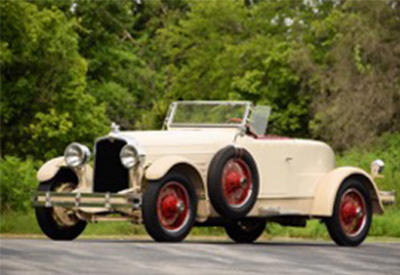 This magnificent Stutz AA Black Hawk Vertical Eight featured a beautiful, sporting boat-tail speedster body — the first American car with that style of coachwork. This example still wears its original ID tag, displaying number AAS570575. It has been carefully restored to exacting standards and is ready for touring or show. The body is finished in a subtle two-tone light beige / tan, which is set off by dark red painted wheels and a red cockpit. Minimalist cycle fenders with fabric mud guards up front, simple alloy step plates and dual side mounts complete the look. The paint finishes and panel fit are excellent. Chrome trim and detailing highlight the quality of the car. 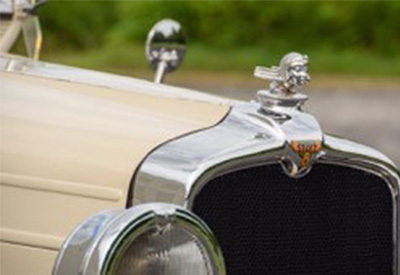 The body is styled with drum headlights, wind wings, dual tail lights and, of course, the wonderful Stutz mascot on the radiator. Inside the period cabin, newer red upholstery is in excellent condition with matching red carpeting. 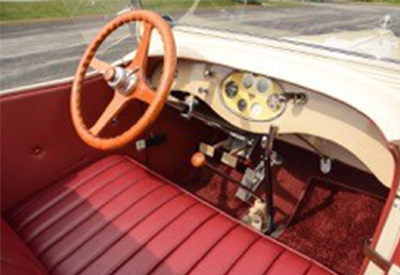 The simple dash features comprehensive instrumentation and a fantastic wood steering wheel mounted on a chrome column. For touring, luggage can be stowed either via the side mounted golf club door or the small trunk in the rear of the body. The Vertical Eight engine is a strong runner and has been very nicely detailed. It is striking, with a beige painted block and an evocative red cam cover. Thanks to the overhead cam and dual ignition, the 298-cubic inch mill is good for a strong 95 horsepower. This particular example also wears a period Wall Oil Rectifier — an early oil filtration device that heats the oil to rid it of unwanted moisture and fuel. The engine bay of this Stutz is a fascinating lesson in clever engineering and fine restoration work. Moscovics-era “Safety Stutz” cars are well-renowned for their robust performance and excellent handling. They remain highly collectible. The example we photographed today has been lovingly restored and invites regular use as a sporty touring companion for CCCA events, or as an entry to nearly any show field in the world.